a sensor that measures airborne particulate matter and sends the measurement data using LoRa to TheThingsNetwork. This has been done before by other people, but it appears there is no universal solution. I am publishing all source code on github and will put up documentation on this wiki. Everyone invents their own payload format, something more universal like Cayenne LPP would be nice. However I could not find a way to encode particulate matter data using Cayenne, so I'll just invent my own payload format too. One thing in particular I'd like to do better than existing solutions is to use proper OTAA for the LoRa connection to TTN. OTAA means over-the-air-activation and is a mechanism to dynamically negotiate communication/encryption keys instead of programmed specifically in each sensor node. Once the OTAA is done successfully, the node remembers device address, session keys, etc for future communication. I don't know what kind of id I can use towards Luftdaten, the regular convention is "esp8266-XXXX", where XXXX is the unique ESP id, but obviously my node is not an ESP8266. The node is based on Arduino, in particular a TTGO ESP32 board with onboard SX1276 LoRa chip. The sensor is an SDS-011, just like in the luftdaten project. For humidity/temperature, I'd like to use a BME280. Page with correct pinout of the ESP32 LoRa board. Luftdaten uses a cycle time of 145 seconds for the SDS011. Not present value is 0xFFFF. Encoding is big endian. Would be nice to use Cayenne for this, but I don't know if Cayenne has an id for particulate matter. Source code for the particulate matter measurement node can be found on the github page. To compile and upload the code to the node, platformio is used. 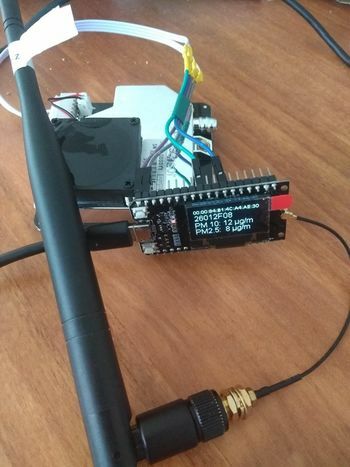 The function of the node software is to collect data from the SDS011 (particulate matter) and BME280 (temperature/humidity) at regular intervals, encode this as a data packet and send it over LoRaWAN towards TheThingsNetwork. The device is registered in the TTN console by the Device EUI (this doesn't happen automatically). Frame counter checks are disabled. OTAA is done only once for each node. After that, the OTAA parameters are stored in (simulated) EEPROM. If OTAA has been done successfully, the node restores the session parameters negotiated during OTAA on next bootup, so it can quickly resume sending data. I'm NOT saving the upload frame counter (this would be preferable), just disable the feature in the TTN console. What about the channel setup? The node connects using 3 frequencies, but receives a bigger list of frequencies during OTAA JOIN. A Java program subscribes to the MQTT stream, decodes the telemetry packets and forwards them to the luftdaten API. There is no storage of measurement data in the Java application.